Nintendo's second handheld game console, the Game Boy combined features from both the NES and the Game & Watch. The console features a dot-matrix screen, five control buttons, a 2 voice speaker, and, like its rivals, uses cartridges as physical media. At launch, it was sold either as a standalone unit, or bundled with the one of several games, including Super Mario Land and Tetris. Several accessories were also developed for the Game Boy, including a carrying pouch and the Game Boy Printer. Despite being technically inferior to its competitors (notably Sega's Game Gear, Atari's Lynx, and NEC's TurboExpress), the Game Boy received praise for its battery life and durability, and quickly outsold the competition, selling one million units in the United States within a few weeks. Together with its successor, the Game Boy Color, the handheld has sold an estimated 118 million units worldwide. It is one of the most recognizable devices from the 1980s, becoming a cultural icon in the years following its release. Several redesigns were released during the console's lifetime, including the Game Boy Pocket (1996) and the Game Boy Light (Japan only). Production of the Game Boy continued into the early 2000s, until it was discontinued following the release of its successor, the Game Boy Advance, in 2001. The original internal codename for the Game Boy was "Dot Matrix Game", and these initials came to be featured on the final product's model number, "DMG-01". The internal reception of the device was initially very poor; the DMG even earned from Nintendo employees the derogatory nickname "DameGame", dame being the Japanese for "hopeless" or "lame" in that context. The standard gray cartridge for the original Game Boy games, although other colors and shapes exist. The Game Boy has four operation buttons labeled "A", "B", "SELECT", and "START", as well as a directional pad. There is a volume control dial on the right side of the device and a similar dial on the left side to adjust the contrast. At the top of the Game Boy, a sliding on-off switch and the slot for the Game Boy cartridges are located. The on-off switch includes a physical lockout to prevent users from either inserting or removing a cartridge while the unit is switched on. Nintendo recommends users leave a cartridge in the slot to prevent dust and dirt from entering the system. On March 20, 1995, Nintendo released several Game Boy models with colored cases, advertising them in the "Play It Loud!" 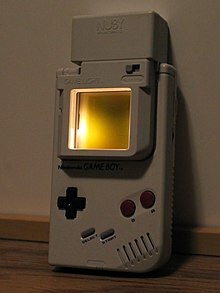 campaign, known in Japan as Game Boy Bros.[b] Specifications for this unit remain exactly the same as the original Game Boy, including the monochromatic screen. This new line of colored Game Boys would set a precedent for later Nintendo handhelds; every one of them since has been available in more than one color. Play It Loud! units were manufactured in red, green, black, yellow, white, blue, and clear (transparent) or sometimes called X-Ray in the UK. Most common are the yellow, red, clear and black, Green is fairly scarce but blue and white are the rarest. Blue was a Europe and Japan only release, White was a Japanese majority release with UK Toys R Us stores also getting it as an exclusive edition to them. The white remains the rarest of all the Play it Loud colors. A rare, limited edition Manchester United Game Boy is red, with the logos of the team emblazoned on it. It was released simultaneously with the Play it Loud! handhelds in the United Kingdom. The Play It Loud's screens also have a darker border than the normal Game Boy. ^ "Happy 20th b-day, Game Boy: here are 6 reasons why you're #1". Ars Technica. September 7, 2015. ^ a b Umezu; Sugino. "Nintendo 3DS (Volume 3 – Nintendo 3DS Hardware Concept)". Iwata Asks (Interview: Transcript). Interviewed by Satoru Iwata. Nintendo. Retrieved March 20, 2013. ^ "Satoru Okada talks Game & Watch, Game Boy and Nintendo DS development". Issue 163. Retro Gamer Magazine. 2016. Retrieved January 1, 2017. ^ "AtariAge - Lynx History". AtariAge. Retrieved November 22, 2016. Eventually the Lynx was squeezed out of the picture and the handheld market was dominated by the Nintendo GameBoy with the Sega Game Gear a distant second. ^ Stuart, Keith. "Nintendo Game Boy – 25 facts for its 25th anniversary". The Guardian. Retrieved November 22, 2016. ^ Audureau, William (2015-03-18). "NX, Ultra 64, Revolution… Petite histoire de Nintendo à travers ses noms de code". Le Monde.fr (in French). ISSN 1950-6244. Retrieved 2016-06-19. ^ a b "Yakuman for Game Boy (1989) - MobyGames". Retrieved December 30, 2016. ^ Masuyama, Meguro (2002). "Pokémon as Japanese Culture?". In Lucien King. Game On. New York, NY: Universe Publishing. p. 39. ISBN 0-7893-0778-2. Pokémon allowed more than metaphorical communication; it made use of a system that created actual communication — a network game. ^ GameBoy Development Wiki (November 12, 2009). 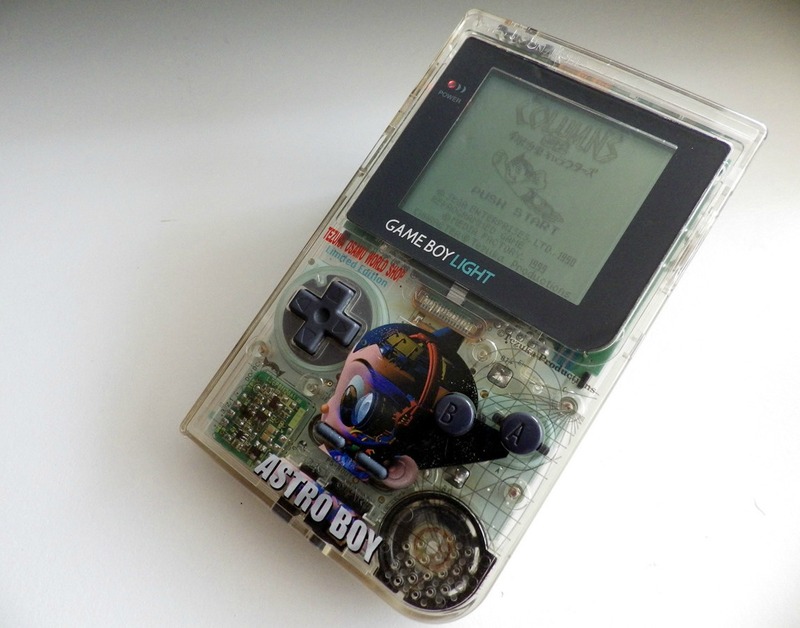 "Gameboy Bootstrap ROM". Retrieved October 24, 2010. ^ a b c Amos, Evan (1989). "GameBoy : User Manual, Page 12". Nintendo of America. Retrieved February 12, 2011. ^ Fruttenboel Gameboy Section (August 22, 2009). 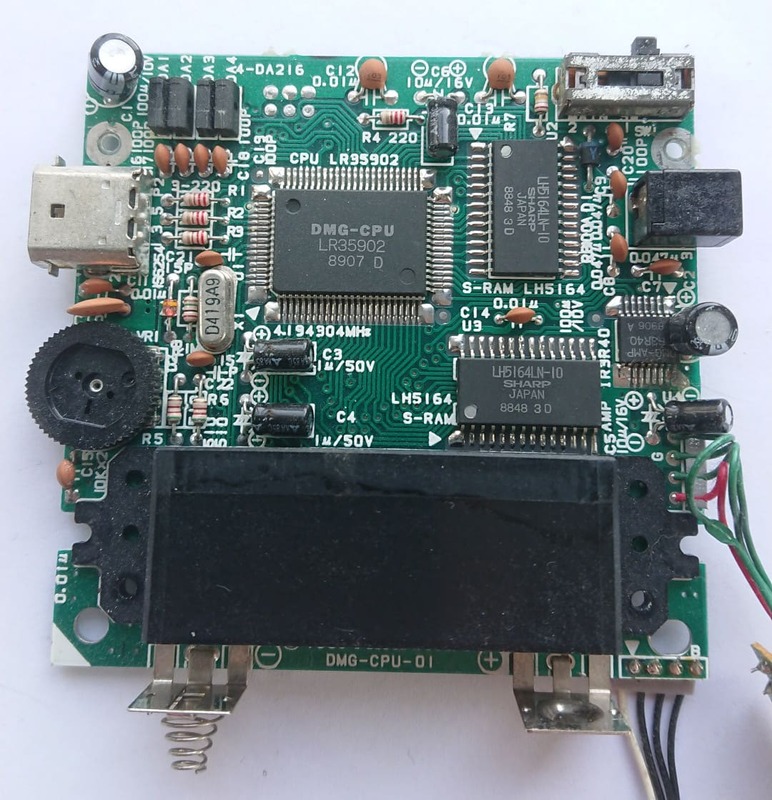 "GameBoy : Using the GameBoy skeleton for serious business (Interrupt Descriptions)". Retrieved March 25, 2010. ^ "Technical data". Nintendo of Europe GmbH. Retrieved 2018-02-04. ^ "Color it loud with hot new Game Boys; Game Boy reflects players own style with five exciting new colors". Retrieved November 3, 2009. ^ Maher, Jimmy (2016-12-22). "A Time of Endings, Part 2: Epyx". The Digital Antiquarian. ^ Fahs, Travis. "IGN Presents the History of Game Boy". IGN. IGN Entertainment, Inc. p. 2. Retrieved October 2, 2013. ^ "Makers Of Games Focus On Girls". The Gainesville Sun. Jan 15, 1995. p. 15. Retrieved March 18, 2012. ^ "''Ball, Game Boy, Big Wheel enter toy hall of fame'', retrieved 5 Nov 2009". Rbj.net. Retrieved August 3, 2010. ^ Reilly, Jim. "GDC: TurboGrafx 16, Game Gear Hit 3DS". IGN/com. Retrieved July 18, 2011.